Doors open at 6:00 pm. Bingo starts at 7:00 pm. Tickets are $25 and include 20 games. A 50/50 last game cover will be available for sale. Extra packages, silent auction, specials, raffles, and baked goods/refreshments will be available for purchase. If paying by check, make checks payable to “CRCSSF”. 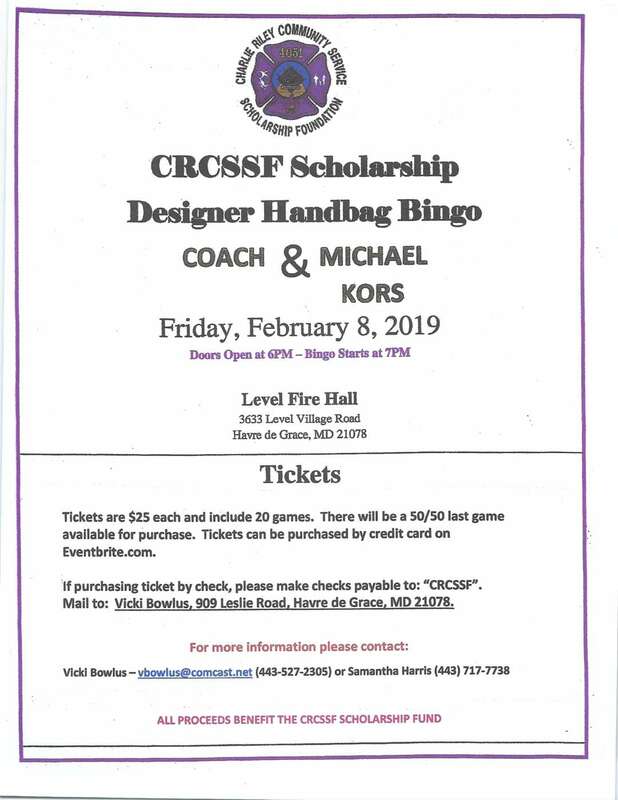 For more information please contact Vicki Bowlus at 443-527-2305 or email (vbowlus@comcast.net) or Samantha Harris at 443-717-7738.Reserved seating for 8 or more.Tickets are required for admission. Proceeds benefit the Charles Riley Community Service Scholoraship Foundation.